Two years ago, I posted about a visit that my family and I made to the graves of our ancestors in the SLC City Cemetary on Memorial Day. We repeated the experience last year and had a profound visit to the resting places of our family there in SLC. Once again, we were not able to make it to other graves located in Sanpete County, Utah last year, or to graves of my wife’s ancestors located in northern Utah and Idaho. 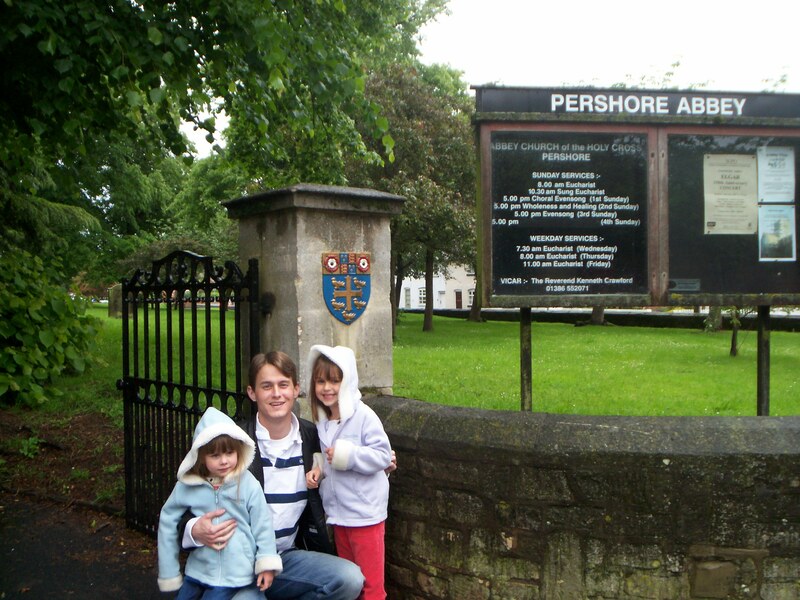 This year, however, we made a Memorial Day visit to the English town where the father of the first Fowles to convert and emigrate is buried — Pershore, England. I had made the visit before (though not on a Memorial Day) while a graduate student in England. But this time was different as my wife and I took our young daughters to the Abbey church in Pershore and spent a little time appreciating the church itself before heading into the cemetary to have a look. Name of the church: Holy Cross, Pershore Abbey (main church in town). For cemetery: according to the 2001 street map, Bridge Street heading north turns to Worcester Road. Left on Three Springs Road (heading south to Upton). Cemetery is on the right of the street, across from Cornmore Rd. The grave is unmarked and you can’t find it without the sexton of the cemetery taking you to the gravesite. Plot K, Space 62. Timothy was a shoemaker and died at age 73. Entry in Sexton’s book Bk 1, p. 16, entry 311. Register of Burials in the burial ground of Pershore, 1875-1892. The church is off Bridge Street, left on Church Street. You can see it, biggest thing in town. We knew we would not be able to see a gravestone for Timothy Fowles but wanted to wander the cemetary in hopes of finding some kind of plot or space markers (the Sexton wasn’t around). 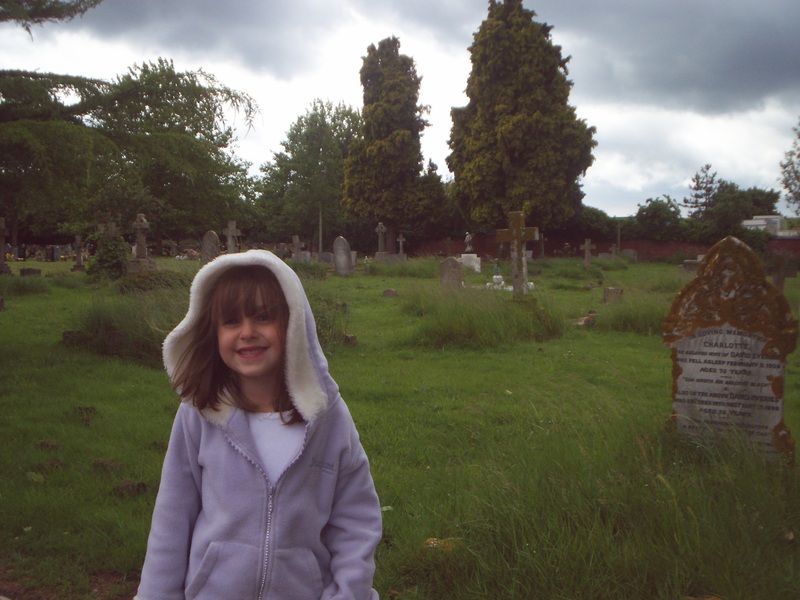 As we walked, my oldest daughter (pictured) wanted me to talk about her ancestor and about “all his children” by which she meant the line from this ancestor down to her, which we had discussed in the car on the drive out to Pershore. She was very intent on finding the gravestone so we examined many. She was greatly saddened upon discovering the gravestone of a baby who was only one day old when she died. For my part, I reflected on the sense of humility that this visit evoked. When visiting our dead in the SLC City Cemetary or in the cemetaries around Sanpete County, a sense of gratitude and appreciation accompanied us. We experienced a feeling of gratitude associated with a knowledge of the religious heritage left to us by those ancestors. 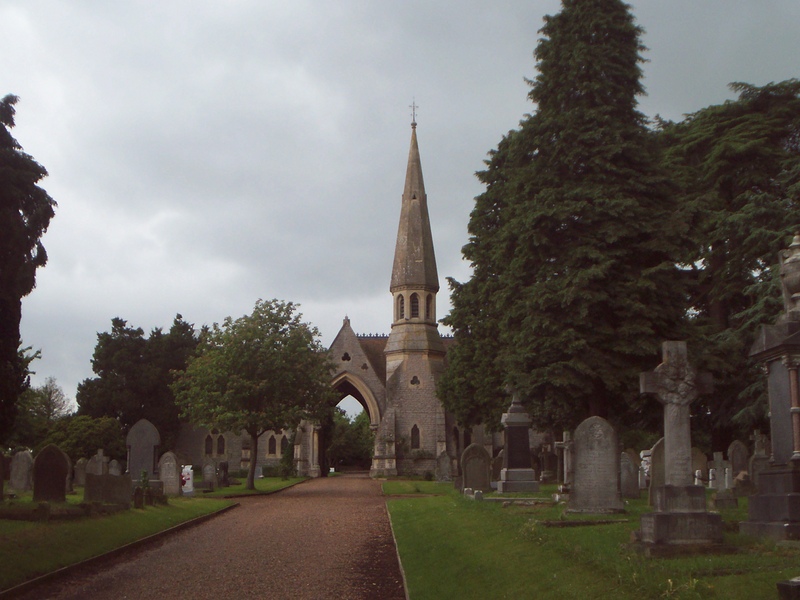 This visit to the cemetary in Pershore, England where this particular ancestor is buried was different. After all, this ancestor’s wife Eliza Sanders and son John — my namesake — are not buried with him there in Pershore. Rather, they lie in Sanpete County, Utah. Timothy’s son John was born in Pershore, England on February 19, 1846 and died in Mt. Pleasant, Utah (where my dad is from) on October 30, 1881. Eliza and John converted to the Gospel and left England while Timothy stayed behind and eventually died in Pershore on February 15, 1881 — the same year that his son died in far away Utah. This knowledge caused a powerful feeling of humility occasioned by the realization of just how messy life can be. Eliza and John made the arduous journey from England to Utah and landed in Sanpete County near Ephraim to attempt to live the Gospel. Timothy did not and stayed back in England, sadly without his family. We are grateful and indebted to Eliza and John for taking the huge step of joining the Church and emigrating even though we are saddened that Timothy stayed behind. We have honored our ancestors who took such steps to pass the Gospel down to us on past Memorial Days. Our desire on this Memorial Day was to honor this ancestor who lived and died in Pershore, England, unfortunately not enjoying of the fruits of the Restored Gospel but succored, we have reason to hope, by his Anglican faith and his relationship with his local parish in the Abbey Church of the Holy Cross in Pershore, England. This entry was posted on Tuesday, May 29th, 2007 at 1:03 pm and is filed under Family, Holidays, Mormonism. You can follow any responses to this entry through the RSS 2.0 feed. You can leave a response, or trackback from your own site. Thanks for sharing this, John. What an appropriate way to spend Memorial Day. It’s strange, I haven’t been to Kanab, Utah — where most of my closest relatives are buried — for more than 10 years. I felt a yearning to do so yesterday. Thanks William. My dad grew up in Sanpete County with a strong sense of Memorial Day, as he has told me, in that you simply didn’t do anything on Memorial Day if not pay a substantive visit to the town cemetary to visit the graves of generations worth of ancestors. Growing up far from the graves of family, however, actually visiting ancestors’ graves was not an activity I really ever did to celebrate Memorial Day; consequently, the holiday really never had any meaning for me until just three years ago, when I moved to SLC and for the first time lived near the graves of relatives. (To be sure, while at BYU I lived within an hour or two of ancestors’ graves but even that is different than living 12 minutes — or one neighborhood — away.) Now, actually using Memorial Day to visit ancestors’ graves is something that has become important to me. I had the opportunity to reflect upon my ancestors as I drove through West Virginia into Maryland over the weekend. My great great great great grandfather Walter died from wounds sustained in the battle of Harpers Ferry in West Virginia. There Stonewall Jackson surrounded a Union garrison and killed over 200 Northern soldiers, capturing over 12,000, before gathering his troops and proceeding to nearby Antietam, in Maryland, perhaps the bloodiest battle in American military history. Even though I did not have time to actually stop at any grave sites, etc., I strongly felt a sense of kinship with and gratitude to my predecessor, Walter, who had emigrated from Newcastle on Tyne to Pennsylvania before he joined the Northern Army. Walter did not join the Church, but his son, also named Walter, did, and he ultimately moved his family to Utah to be part of the Mormon community. Cool experience Pete. Thanks for your comment. Seeing the geographical setting in which your ancestors lived can be a magical experience — at least it always is for me. Wonderful, John, but sad too. I feel very sorry for Timothy in many ways. Can we imagine how it would feel if our children joined another religion and moved to the other side of the world, never to be seen again. There’s a lot of pain in this tale. I know Pershore well, being only a spit and a blink from Malvern. I played cricket near that church when I was a kid. I’m tickled that you’re from Worcestershire too! Ronan, you’re right that there is and must be some measure of drama behind the fact that Timothy lies in Pershore and his son John lies in Utah. I referred to the sense of humility that this knowledge invoked in the post. We know more of the details behind this situation but I can’t remember them well enough to have discussed them in the post. Suffice it to say that I believe you’re right that there is a lot of pain in this tale. One wonders what might have happened if Timothy had accepted the Gospel and travelled to Utah with his family, how having him around out there might have influenced the future of the family down to the present day. One also contemplates the outcome had Eliza and John not converted but stayed back in Pershore where generations of their posterity might still have lived and died. Yep, and you and I may have faced each other across a wicket in 1991!